Offering you a complete choice of products which include dip pretreatment plant, spray pretreatment plant, conveyorised pretreatment plant, heat tanking systems, air agitation system and surface treatment plant. We offer Spray Pretreatment Plant is online cleaning process which consists of a tunnel mounted on tanks, components piping pump and nozzles etc. The design is based on conveyor speed, article profile & pretreatment timing. 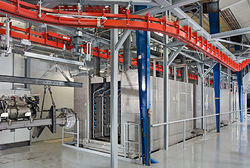 The spray tunnel is designed on a completely weld less system. 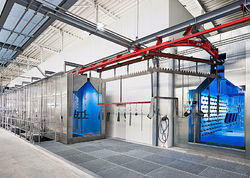 The Spray Pretreatment plants made of complete Stainless steel or MS or combination of SS & MS spray tunnels along with direct or indirect heating system, vertical pump for high transfer efficiency, and Easy clip on nozzles with PP revolving tip to adjust Nozzle spray, FRP catwalk with door for easy maintenance. 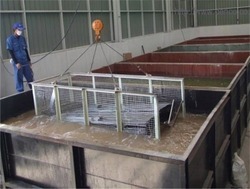 The tank design is eliminates leakage and all sprayed chemicals fall back into the tanks. The heating system is designed as best heat transfer and consume minimum of the tank volume. The oil skimmer is incorporated as every system to keep the cost of refilling low by getting the most out of the chemicals. 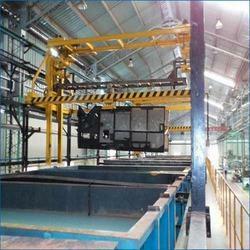 We Offers Conveyorised Pretreatment Plant. 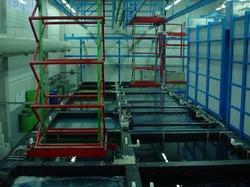 Which as Overhead Conveyor which takes vertical up & down bends inside the pretreatment tanks. The tanks are made sloping at entry and exit. Generally the conveyor speed is fixed and tank lengths vary according the chemical specifications (Dipping type). This system is suitable for small and medium articles having low weights, few chemical requirements. We Offer Heat Tanking Systems. Tanks are usually fabricated Mild Steel and Stainless Steel Sheets. with Heating Media as Electrical Heater, LPG Burners, Stream Heater.Etc. The S.S tank is needed for possessing phosphate alternative, the alternative is warmed to seventy-degree Chemical using oil-fired home heating or electric heaters together with automatic heat range control. The tank is insulated by all attributes & bottom part using vermiculite/ceramic fiber insulation. We are the manufacturer of Phosphate Tank used as Pretreatment metals like Mild Steel Aluminum Al Casting Material Galvanized Sheets prior to Painting/powder coating. We Offer’s Air Agitation Systems is complete line of industrial tank mixing equipment for mixing and blending. Large bubble, compressed air mixing solutions are available in a wide range of models and styles to suit your tank mixing applications. It is the versatility, durability and dependability of liquid mixing systems that so many companies worldwide have come to rely on for their mixing and blending solutions. We Offer’s of Surface Treatment Plant shops guarantees high quality, reliable and flexible surface treatment operation close to our customers. We provide services we take full responsibility on the process, and our services are always based on the turnkey principle. In addition to the surface treatment and corrosion protection services, we provide sub assembly, accessory equipment, and packaging and product delivery services. Looking for Pre Treatment Plant ?